When so many lives are at stakes and wars will commend so many lives. The similarity of both these anime is well the death you'll know what I'm talking about once you see both anime. Both anime have some colorful characters so see both anime and their beautiful and yet gruesome story line. They both had a character that made a contract. The monster/demon is a weapon. Both main characters have a goal they promised them self to do. Both anime are set in a futuristic age and both of the main characters experience a loss that drives them to act as they do. Both anime have themes of action and fantasy and a main character full of determination. Whilst watching Chaos Dragon I was heavily reminded of ONS. Both at fantasy setting with a diverse cast of characters and great fights. Both involve a Black Plague over taking the land and the heroes try to find a way to stop it. Both are based on games. Both shows have a similar plot in which the MC fights for their kingdom. Both shows show how a bad fantasy RPG campaign looks like, but for different reasons. Chaos Dragon has some bad players (Urobutcher is not alone in this one), while Goblin Slayer would have one of the worst GM imaginable who promptly goes down the list of things not to do. Kuga (WT) and Ibiki (Chaos Dragon) looks very similar. However they act as opposites, their goal is pretty much the same. Also, both anime's start off as light-Cute-Funny anime's. However, early on through the anime it begins to turn 'Dark'. Instead of your happy-cute-fun Anime, we have a hint that the anime isn't exactly all Fun & Games, and we begin to see the true colors of World Trigger. Both MC's seek for revenge, for a fallen loved one. - Each anime is about 'Revenge', that relates towards 'Family'. - Lots of action, and cute moments between our MC's. 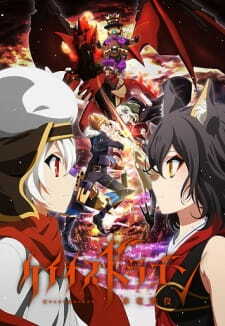 - Each anime is about forming a pact (Chaos Dragon), or a contract (Kuroshitsuji), where in exchange for something precious, they are returned with a wish that is to be granted. Both involve the young protagonist fighting for the original political faction, for Arslan it's Pars and for Ibuki it's for the Revolutionary Army (Originally Nil Kamui) against other invading countries. An anime adaption based on a game. The main characters from both anime are linked to a dragon. Both of them want revenge because of said incident in the past. There is a cat eared girl character too. He and his group set off to uncover the mystery behind the dragon within them. Both anime taking place in a similar setting. Someone dies like every episode. You see a lot of shady characters appear but their purpose isn't made known until later. The art style is also pretty similar, especially the eyes (like the shape and size and how they are positioned on the face). - Chaos Dragon and Pandora Hearts has characters forming 'Pacts' with a supernatural being. - Both start off being a cute fantasy, with our MC's as young children. Very soon we are awaken with the true content of what the anime's trying to give us. In other words, a Fantasy that turns Dark.